Starring spinach, avocado, and berries with crunchy almonds and a tangy-sweet dressing, this is a crowd-pleasing, colorful, gluten free salad is great for cookouts and brunches, though it’s so good, it could easily end up in regular dinner rotation. In a small bowl, combine the vinegar, oil, sugar, shallot, salt, and dry mustard. Whisk until emulsified. Add the poppy seeds and whisk to incorporate. In a large bowl, combine the spinach and herbs. Toss with dressing to taste. 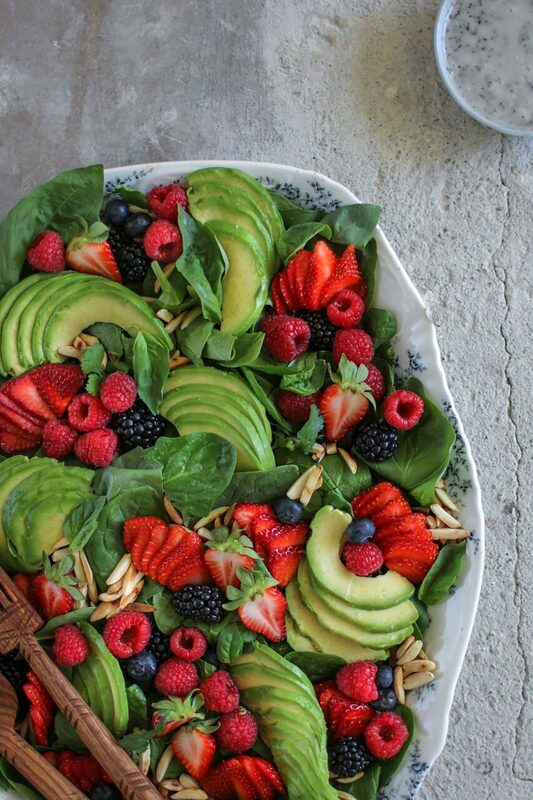 Arrange the spinach mixture on a large platter, top with the avocado, berries, and almonds. Serve immediately.